Here's the most recent painting with the remaining three stages. The photo of the last stage is a bit washed out - the photo was taken outdoors. I missed yesterday's deadline entering it in the "Out on a Vine" show to be judged by Keiko Tanabe . I have an immense amount of respect for her as an artist and the beautiful way she has of doing washes in watercolor. There'll be other shows and besides, this painting still needs a name. "Wild Orchid" is the front-runner but I'm still pondering other names and may darken that blue in the upper-right side before I sign it. I'm planning my new painting that will be of two finches in a blossoming tree. I've been thinking a lot about Japan, my mom, my relatives and want to paint something beautiful. I've seen a lot of art that incorporates the recent disasters of Japan with iconic Japanese art block prints and find them depressing. Watching a recent newsclip on tv, I was very touched on a story of Japanese elderly lady, currently evacuated in a school gymnasium, who had picked a few cherry blossom branches and some paperwhites. She had put them in a little paper cup tenderly making a humble ikebana arrangement. I love her spirit of finding the good and beautiful even in such devastation. With the 9.0 earthquake, tsunami and now the grave nuclear disaster, it's turning out to be the Ides of March for Japan. My mom's adoptive family are long since gone. 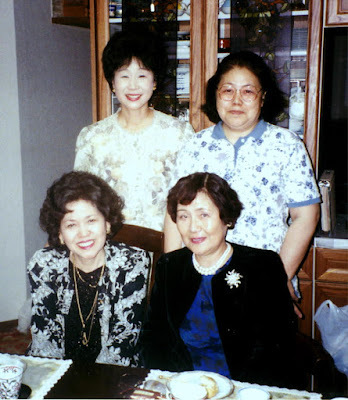 My natural relatives (mom's living sisters) live in Chiba and around Tokyo and I can only assume they are all okay. My mom found out she was adopted not to long after she was married, and what a family (Ohba) rich in history. Mom was rather closed-lipped about the Japanese relatives, thus my brother and sisters didn't really know too much about them other than the rich family history, the photographs in her albums, and her stories about visiting them in Japan. After the earthquakes and tsunami, I was busy trying to find the married last names of all her remaining living sisters, Fumiko, Akiko, and Hisako, inorder to find out if they and their families were all safe. Mom wrote everything in Japanese and of course, I can't read it. Until I find someone who can translate and in the odds that they should look me up, here's a photo of all the Ohba sisters taken in 1997. My mother, Kazuko - the youngest daughter of Zenkai & Asano, is seated on the left and next to her is the eldest living sister, Fumiko. Standing behind Fumiko is the next oldest sister Akiko, and next to her is her younger half-sister, Hisako. We're laying very low in California, going about life day-to-day in blissful ignorance and hoping that the Pacific plates and all the major fault lines will not repeat this horrible disaster here. We also have a nuclear power plant nearby. If at all possible, please donate what you are able to give to the American Red Cross to help the thousands of displaced people in Japan http://www.redcross.org/ . I have an orchid painting in progress and it's larger than the other paintings I've done on watercolor paper. Keeping Georgia O'Keefe in mind, it's my intention to make this flower explode in color with life and energy. In the past month, I've had the honor and success entering and getting juried into a couple of recent shows: Create a Mood and the Top 100 shows. It's been a long road since I've re-entered the painting world 2 years ago. Though I've had a lot of worries and doubts, I've been accepted into all the shows I've entered. I know I have a long ways to go, but I am comfortable now calling myself an artist!